To launch the limited edition Alfa MiTo Quadrifoglio Verde SBK, an overtaking stunt was performed at the Silverstone Circuit in Britain involving precision driver Paul Swift. Paul Swift, who is behind the helm of the MiTo, balanced the car on two wheels. Chris "The Stalker" Walker overtook the MiTo on his Kawasaki Ninja by going underneath the precarious-looking MiTo. 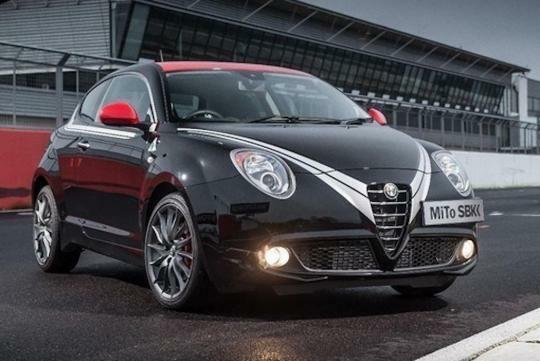 The limited edition MiTo has special body decal and comes with a red roof and a pair of red side mirrors. It wears a set of 18" alloy wheels complete with red Brembo calipers behind. The SBK will get the same 170bhp 1.4-litre MultiAir turbo like the standard car. The MiTo SBK is built to celebrate Alfa's association with the World Superbike Championship whereby the company is the title sponsor of the series and supplies safety cars as well.